(CNN) Only a skull and a pair of trousers remained after a suspected rhino poacher was killed by an elephant and then eaten by lions in Kruger National Park, South African National Parks said. 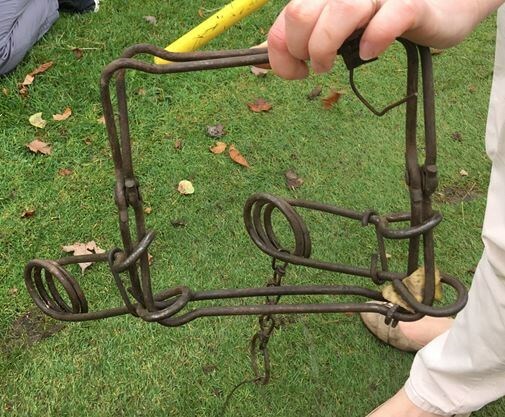 Here is a picture of the conibear trap that killed Paul Wildeboer’s dog on a golf course in Port Elgin in November of 2017. 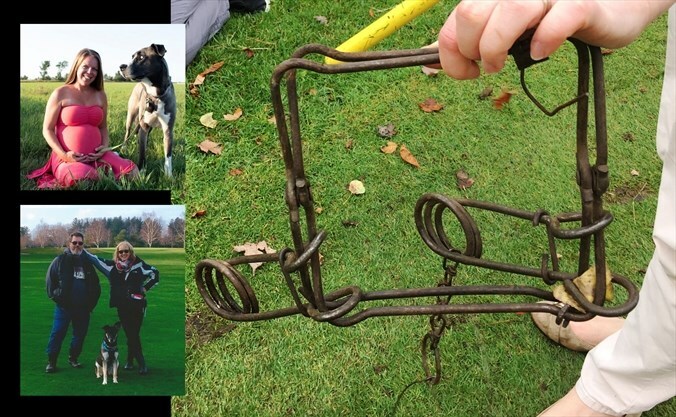 As a ministry investigation into the death of a Dundalk dog killed by a conibear trap continues, a man whose dog suffered a similar fate wants the province to better safeguard people and their pets from these “body-gripping” traps. “It should be mandatory (for trappers) to post warning signs. For example, ‘Danger, do not enter. 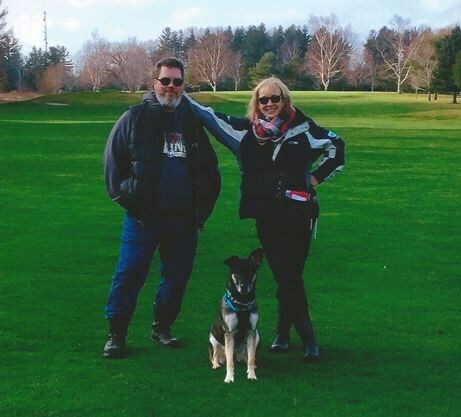 Animal control in progress,’” said Paul Wildeboer, whose 70-pound shepherd cross was killed by a conibear trap on a golf course in Port Elgin back in November 2017. In the early afternoon of Nov. 15, Dundalk resident Cheryl Ireland’s mother, Elaine, and her friend were walking her dog, Winston, in a large field behind their home near Mill and Braemore streets. Suddenly, they heard a loud yelp and discovered Winston had been caught in a conibear trap. The dog, a Great Dane, bullmastiff and husky mix, died shortly afterwards. “They did everything they could to try and keep him alive. (My mom) got some neighbours to try and help, but by the time they went out there, it was too late. He was gone,” Ireland said following the incident, noting a smaller trap was also discovered nearby. Ministry of Natural Resources and Forestry (MNRF) spokesperson Jolanta Kowalski reports the investigation into Winston’s death is ongoing. She said the MNRF recently reached out to the public for any information that could help the case. “The MNRF has been here twice since (Nov. 16) but still haven’t really got anywhere. We do know who it is and (the investigator) has been to his house,” Ireland told The Banner. The accident happened at a home in Unity, Oregon. BAKER CITY, Ore. — A Baker City man has died following a hunting accident, according to the Baker County Sheriff’s Office. It happened Tuesday at around 6 p.m. at a home in Unity, Oregon. Deputies say they found the victim, George Sherman Van Cleave, next to a pickup in a driveway. The sheriff’s office says another man, Richard Toubeaux, was securing a rifle in the pickup after the parties returned from a hunting trip. The rifle discharged and hit Van Cleave. WARNING: Some pictures in this story are graphic. ALBUQUERQUE, N.M. (KRQE) – It’s a hotly debated topic in New Mexico: whether or not to ban animal trapping. Now, a local rescue group is pushing for the ban after a lost pup barely escaped with his life. When Argos Animal Rescue first found Kekoa, they didn’t think he would make it through the night. Now, after a miraculous recovery, he’s acting as their poster pup for change. A warrior who survived days with his leg caught in a steel trap. On November 27, Argos Animal Rescue and K-9 Rehab got a call about the horrific conditions Valencia County Animal Control found Kekoa in. Tracie Dulniak with the K-9 Rehab Institute says this type of injury is becoming more and more common. 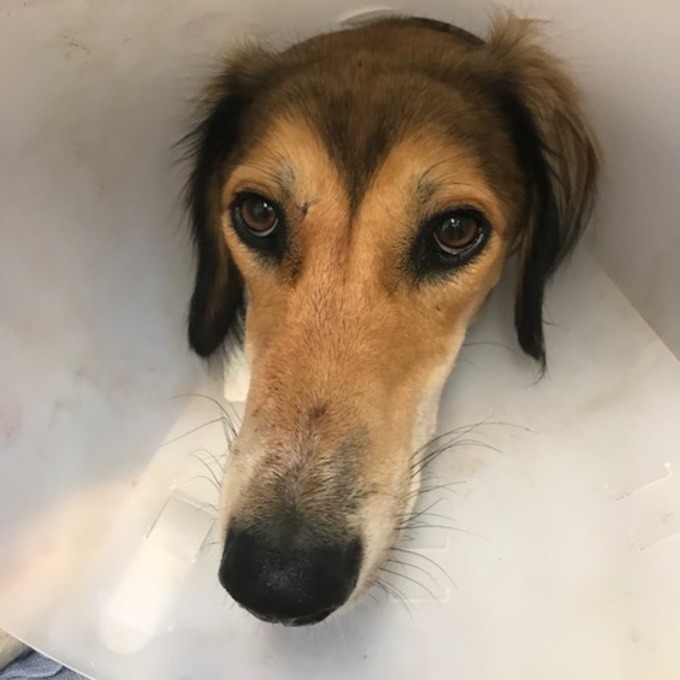 “We get a lot of these dogs that are coming in from other counties and other states that have been severely abused or injured through traps,” Dulniak said. This leaves the injured dogs with emotional, physical and mental scars, a concern that Trap Free New Mexico says should be addressed. “We shouldn’t have to rely on New Mexican’s dogs stuck in traps until we abolish the practice,” said Christopher Smith, advocate for Trap Free New Mexico. It is a practice that state legislators have tried to ban before, but has remained legal. 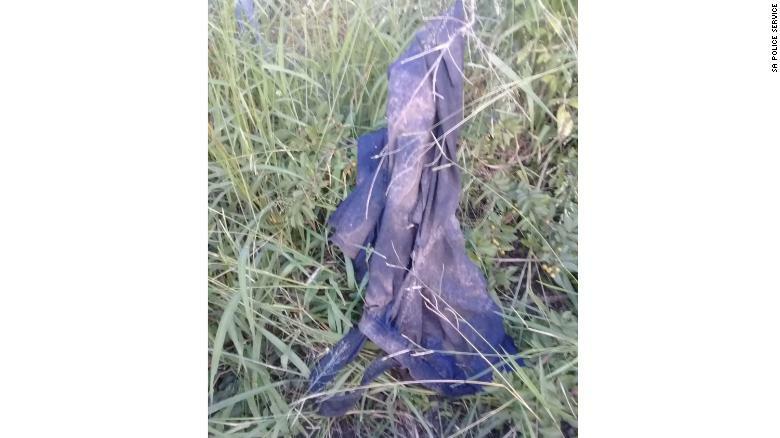 Current laws say a trap must be 25 feet or more from a trail and checked every day. The only possible changes coming to the law, at this point, is that Game and Fish is considering increasing the setback requirement to 50 feet. Kekoa’s medical bills have exceeded $3,000. Argos Rescue and K-9 Rehab are now asking for help with those bills and boarding and are searching for a skilled foster parent to care for him because no one has claimed him. KRQE News 13 reached out to the New Mexico Trappers Association for comment, but did not hear back. More people have come forward about their dogs being caught in traps at Island Lake State Recreation Area in Green Oak Township. Green Oak Township resident Mark Timney reported an incident to the Michigan Department of Natural Resources involving his female German short hair pointerdog being caught in a trap there on Oct. 25. His dog was not on a leash, he said. “When I reported it to the DNR hotline, the officer informed me that yet another dog discovered (but was not caught in) the trap earlier that morning. So it appears this is not a one-off incident. That area of the park is used daily by many people who train their dogs off the leash,” Timney said. Timney also provided a photo of the trap, located about 50 feet outside of the Spring Hill mining operation near McCabe Road, which shows a chain-linked and clamp-like mechanism. “Fortunately, I was able to release her,” Timney said. He said he came back two days after the incident and the trap was gone. “I’ve been walking my dog there for years and never encountered a trap,” said Timney, who said he continues to take his dog to the park. The Green Oak Township Fire Department was called to an incident on Oct. 18 to get a trap open to release a dog caught in it, the department confirmed on Tuesday. Brighton resident Jamie Tobbe said her dogs got caught in a trap in the park on Oct. 29 and although they were not hurt, were frightened after the incident. Andrew Haapala, unit manager of Island Lake State Recreation Area, could not be reached for comment. At the time of the incident involving Tobbe’s dogs, Haapala said the traps were put there legally and that trapping is legal on state-owned land. 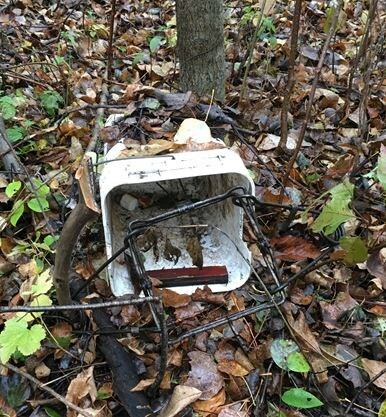 In order to place a trap on state land, it must be marked with the name of the trapper and a Michigan Department of Natural Resources identification number. A man in New York developed an extremely rare and fatal brain disorder after he ate squirrel brains, according to a new report of the man’s case. Chen didn’t treat the patient, but she uncovered the case while writing a report on suspected Creutzfeldt-Jakob disease cases seen at her hospital in the last five years. Creutzfeldt-Jakob disease (CJD) is a progressive neurological disorder that affects only about 1 in a million people each year worldwide, according to the National Institutes of Health (NIH). It’s a “debilitating disease” that progresses quickly and usually results in death within one year of diagnosis, Chen told Live Science. There is no treatment or cure. There are three forms of Creutzfeldt-Jakob disease (CJD): one that is inherited, one that comes from exposure to infected tissue from the brain or nervous system (this form includes vCJD), and one type that is “sporadic” and does not appear to have a genetic or environmental cause. That’s when the doctors came across the case tied to squirrel brains. Tests indicated that this was a “probable” case of vCJD because of the MRI finding and a test that showed specific proteins in the patient’s cerebrospinal fluid, which often indicate the disease. Diagnosis may be delayed, in part, because CJD is rare and is not “on the tip of the physician’s mind” when assessing a patient, Hanna told Live Science. In addition, once doctors suspect CJD and order a cerebrospinal fluid test, it typically takes around two weeks to get the test results. The report highlights the need for doctors to keep CJD diagnosis in mind and for hospitals to have “policies for infection control when it comes to CJD,” Hanna said. ALLAMUCHY — A 47-year-old hunter fell approximately six feet into an open sewer drain Friday night after allegedly shooting a deer with a bow and arrow in violation of the state’s 150-foot safety zone for bowhunting in residential areas. The man, who sustained a head injury in the accident, later was flown to Morristown Medical Center. Authorities were alerted to the accident, which occurred in a wooded area near the intersection of Old Allamuchy Road and County Road 517, shortly after 8 p.m. Friday. Members of the Hackettstown Police Department, Hackettstown Rescue Squad and Hackettstown Fire Department arrived on the scene minutes later, as did paramedics from Saint Clare’s Health, where they observed the man in the sewer drain. Firefighters and rescue squad volunteers rescued the man shortly afterward and transferred him to an Atlantic Ambulance helicopter. Through a preliminary investigation, police determined that the man fell into the sewer drain while he and another person were attempting to retrieve the deer’s carcass. 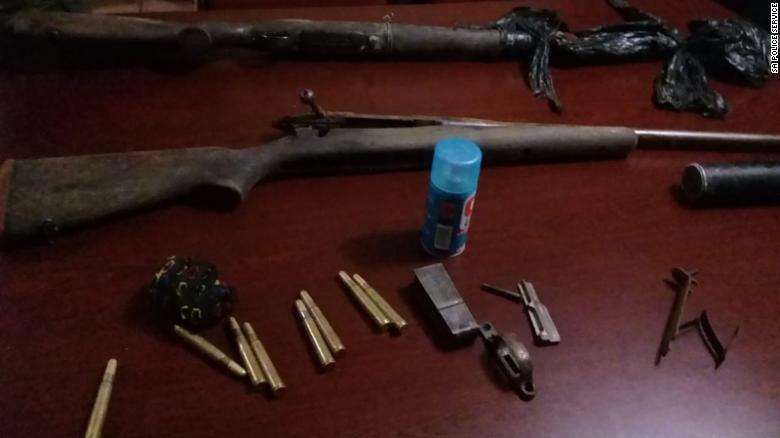 Although the man has not yet been charged, police indicated that it was determined through further investigation that he was hunting in illegal proximity to a nearby apartment building. State law requires those engaged in bowhunting on lands to be at least 150 feet from a residential dwelling, and at least 450 feet from a school playground. Those hunting with firearms must also do so from a minimum of 450 feet away from a residential building or school playground. The matter remains under ongoing investigation by police, who are being assisted by the state Division of Fish and Wildlife. 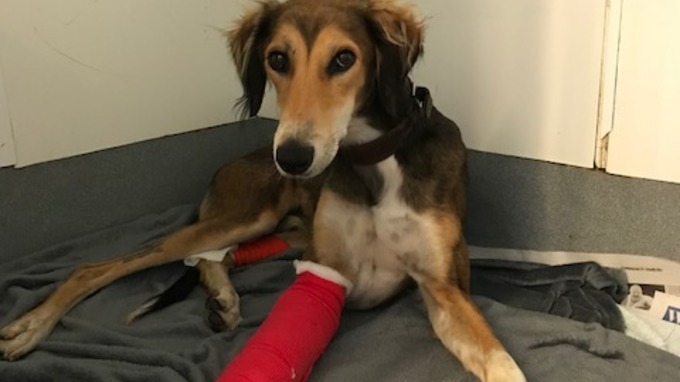 A dog who was ‘left for dead’ with serious leg injuries is recovering at an RSPCA hospital. 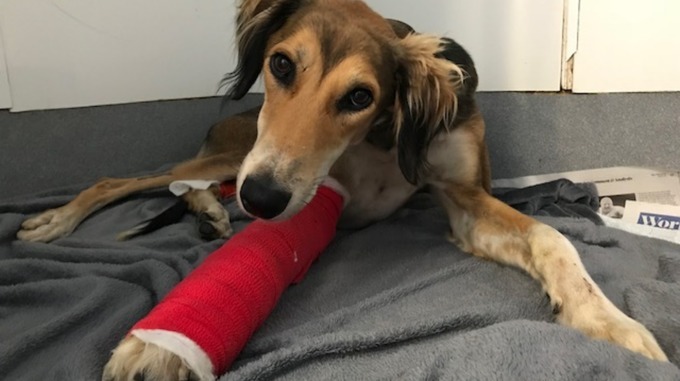 Five-year-old Saluki Zach was found with serious injuries on Fambridge Road in Maldon earlier this month. Zach suffered a broken leg and also had a nasty open wound. He will require surgery although vets hope to save the leg. Police were also called to the scene after the driver of the car failed to stop following the accident. The owner of the dog holds up the trap that seriously injured their pet (FOX5). 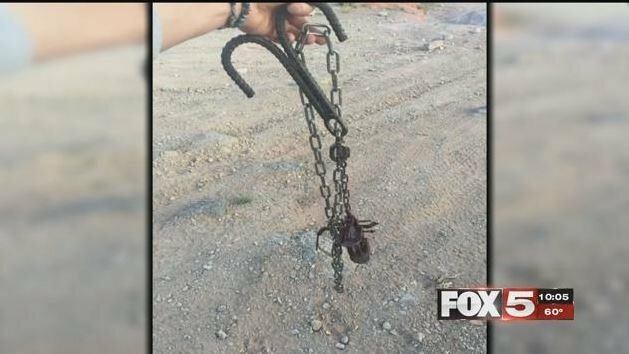 LAS VEGAS (FOX5) –A dog suffered serious injuries after being caught in a leg trap near a popular trail, according to a witness who was hiking near the area. Brandon Kennedy said he hikes at Little Red Rock once or twice a month. Little Red Rock is an area north of Red Rock Canyon, that boasts trails and unique rock formations. But while Kennedy was hiking with friends on Friday, he heard screaming. “Almost like bloody murder,” Kennedy said. He said the screams were coming from a couple hiking nearby, and when he went to help them, he found a dog severely injured after it’s leg was caught in a trap set up near the trail. Trapping is legal in Nevada, as long as the person setting the trap has a license and follows a list of regulations. On its website, the Nevada Department of Wildlife advises trappers to “be considerate of those who enjoy the outdoors,” and to “avoid setting traps near neighborhoods or along trails frequented by others.” Kennedy said in this case, the trapper ignored that advice. ANDERSON Co., S.C. (WSPA) — One person is dead in what appears to be a hunting accident in Anderson County. Authorities received a call around 8:35 p.m. Wednesday about a hog-hunting accident on Gentry Road in Starr, Anderson County Deputy Coroner Charlie Boseman said. Boseman said it appears a hunter was killed in an accidental shooting. The victim has been identified as Kenneth Jason Young, 40, of Starr. Boseman said Young lived on Good Hope Church Road and was hunting in a nearby field. Boseman said a man and woman were also hunting hogs. They were not hunting with Young, nor did they know him, according to Boseman. He said the woman was using a heat sensor scope and fired a shot – not realizing she was shooting at a person, Boseman said. It appears Young was kneeling when he was fatally wounded. The Anderson County Sheriff’s Office and S.C. Department of Natural Resources are investigating the shooting.